STUDIES ON THE CHEMICAL CONSTITUTION OF EGYPTIAN NIGELLA SATIVA L. SEEDS. II1) THE ESSENTIAL OIL. 1 The first communication is published in Planta Medica 11, Heft 2, (1963). 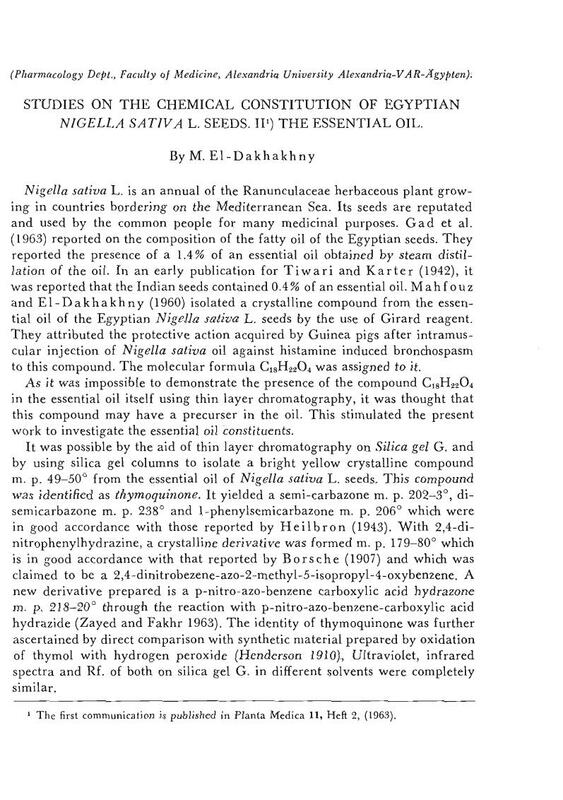 Thymoquinone was isolated from the essential oil of Nigella sativa L. seeds. It was identified through; melting point, mixed melting point, RF–value, UV–and IR–spectra comparison with thymoquinone prepared by oxidation of thymol with hydrogen peroxide. Moreover, its identiy was assurred by the preparation of its semi–carbazone, disemicarbazone, phenylsemi–carbazone, and 2,4–dinitrophenylhydrazone. A new derivative was also prepared i. e. p–nitro–azo. benzenecarboxylic acid hydrazone. Furthermore, it was reduced with sulphur dioxide to thymohydroquinone, the identity of which was confirmed by its diacetate and dibenzoate. Thymoquinone also dimerized into dithymoquinone. All the compounds derived from thymoquinone were in good accordance with those described in literature. Aus dem ätherischen öl der Samen von Nigella sativa L. wurde durch Chromatographie an Silicagel G Thymochinon isoliert. Es wurde durch die Bestimmung von Schmelzpunkt, Mischschmelzpunkt, RF–Wert, UV– und IR–Spektrum und durch Darstellung und nähere Charakterisierung der folgenden Derivate identifiziert: Semicarbazon; Disemicarbazon; Phenylsemicarbazon; p–nitro–azobenzolcarbonsäure–hydrazon; 2,4–Dinitrophenylhydrazon. Aus der Bisulfitverbindung wird beim Ansäuren das Thymochinon durch gleichzeitig entstehendes Schwefeldioxyd zum Thymohydrochinon reduziert. Bei Luftzutritt wird Thymochinon zu Dithymochinon dimerisiert. Die Charakteristica aller hergestellten Thymochinonderivate zeigten eine gute Übereinstimmung mit den Literaturangaben.